Hangzhou is the capital of the Zhejiang province. It is the cultural, economic and political hub of the province and is also one of the most enjoyable and popular tourist destinations in all of China. The city is located on the Qiantang River, in the southeastern portion of the country. Hangzhou experiences all four seasons and its’ weather is mild and steady throughout the year. This means that any time is a good time to visit the area as it relates to climate. Perhaps, the most popular landmark in all of Hangzhou is the West Lake. It is well known for its’ beauty, which naturally supports and enhances the other historically and culturally significant sites. In the West Lake area, the Six Harmonies Pagoda, Solitary Hill, Ling Yin Temple and the Mausoleum of General Yui Fei are all high trafficked destinations. Ten West Lake Prospects also allows tourists and the locals panoramic and breath taking views of the lake, various monuments, as well as the mountains. Hangzhou, a scenic view of famous West Lake, often a subject of Chinese landscape paintings. 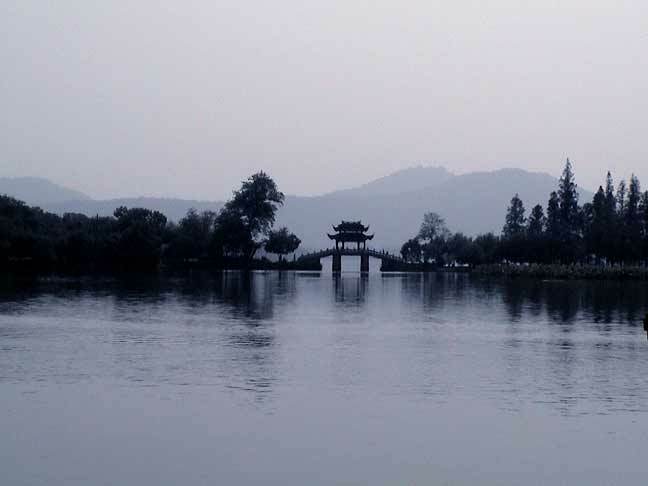 A misty view of an open excursion boat on scenic West Lake. A view of the famous Viewing the Moon Pillars on West Lake. Dragon Boat on West lake. A tranquil garden house in Hangzhou. Hangzhou, garden house in an historic Wine Garden. Part of our October 2004 group, on a garden island in West Lake.